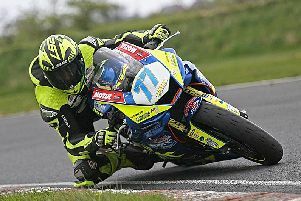 Top British Superbike rider Glenn Irwin. Top British Superbike rider Glenn Irwin says the lack of a world-class motorcycling facility in Northern Ireland won’t have any impact on the development of young riders in the future. The Carrick man was speaking after it came to light on Wednesday that plans for the proposed £30 million Lake Torrent motorsport complex have floundered, with the developer - Manna Developments Ltd - going into receivership. In January, a three-year deal was announced with World Superbike promoters Dorna to bring the series to the Lake Torrent track in Co. Tyrone as early as 2019. However, problems at the proposed site at the former clay pits at Coalisland slowed progress earlier this year, before the project hit a brick wall after the developers went into receivership on Monday. Irwin, who finished third in this year’s British Superbike Championship, was always sceptical over the feasibility of the venture. The 28-year-old agrees it would have been a ‘dream’ scenario if a World Superbike round came to Northern Ireland – particularly given Jonathan Rea’s unprecedented success – but Irwin says there was nothing to lose in the first place. “I don’t think this will have an effect on the opportunities for young riders coming up in the future. If you look at our history here, the likes of Joey Dunlop and Brian Reid – who became world champions – grew up racing on circuits like Aghadowey and Kirkistown,” said Irwin. Irwin, who will ride for British Superbike title-winning team JG Speedfit Kawasaki next season, says Bishopscourt in Co. Down is more than capable of hosting a BSB round if suitable funding could be obtained to meet the cost of bringing the championship to Northern Ireland. “I think Bishopscourt is on a par with a lot of British Superbike tracks. It’s not a Silverstone or a Brands Hatch, but it’s better than Knockhill, certainly. It’s also better than the Indy circuit at Brands,” he said. “We have a great facility there and things like the access roads could soon be improved. Garages could also be put up there very quickly and you could actually run a BSB round at Bishopscourt. “But the main thing is that you have to actually pay the series to be able to host a round, and we can’t get government funding behind it at the moment because we don’t really have a government,” Irwin added.